Much of the following comes from research done by John Martin (indicated in text) - I have added to it where I can. As the principal males are nearly all called William, I have numbered them. A Martin family later living in the Charles the Martyr parish may be a different Richard and Maria. Robert, the son of Richd and Maria Martin, was baptised in January 1815, in St Andrew parish. Richard was a farmer. Julia Martin was baptised in November 1822, the daughter of Richard and Maria, of Tavistock Road. Richard was a farmer. At the time of the 1841 census, a Richard and Maria Martin are living Tavistock Road, Charles the Martyr sub district, Plymouth, with a number of younger Martins who may or may not be their children (the 1841 census does not specify relationships). Richard and Maria are both circa 60 (the census also rounds down ages); Maria is 35, Sarah and Robert are both circa 25, Jane Ann and Julia are both circa 20. All were born in Devon. Maria Martin, aged 73, was buried in the parish of Charles the Martyr in May 1850. She was 73, and her abode had been Tavistock Street. Richard was a 74 year old widower in 1851, living in the parish of St Charles the Martyr with his unmarried daughters Jane and Julia, 27 and 25 respectively. By 1861 Richard, now 84, was a proprietor of houses, living at 27 Tavistock Road. His unmarried daughter Jane A Martin is with him on the census. Richard Martin, aged 90 and of Portland House, died on May 25th 1867 (Vicar's note). He was buried in the parish of Charles. None of the above details match the earlier baptismal records quoted above, and family tradition has it that both Richard and Maria had died by the time of the 1841 census. Believed to have been originally from France, the story goes that both were returned there for burial (source: John Martin). By 1835 William (1) may have been in Ashburton, married to Elizabeth. On 7th January a William Martin was baptized to William and Elizabeth, but the father is said to be a butcher. All other references to William (1) describe him as an ag lab (agricultural labourer) or farm labourer. In 1841 William (1) and Elizabeth are living with 6 year old William (2), Emma and Jane. William is an ag lab (agricultural labourer). The 1851 census shows the Ashburton William as a farm labourer, with wife Elizabeth and children Emma, Jane, Eliza and Elizabeth. William says he was born in Plymouth. Emma, Edith and Sarah are shown with their parents on the 1861 census (http://www.freecen.org.uk/) William (1) is an ag lab and the family live in North Street. Elizabeth (maiden name also Martin) was born in Ashburton, and worked as a laundress. Devon Heritage Centre holds a licence for the marriage of William Martin of Ashburton and Elizabeth Martin of Tor Moham. The licence is dated 10th September 1834. On the 1881 census both William (2) and Sarah J are in Cad Lane, Ashburton, with 5 children including Elizabeth Jane and 12 year old William (3). William (2) is a general labourer. On the night of the 1891 census, http://www.freecen.org.uk/ only William (3) and one of his brothers is with their parents. William (3) is a general labourer, as is his father. The Martin family are still in Cad Lane, but not too far away at Great Bridge is another family, headed by a widow named Mary J Pascoe. She is a wool weaver from Cornwall, and on census night her unmarried sister, Sarah A Found is staying with her. Mary J has 3 children, two of them born in Yorkshire. But the youngest, William, aged 1, was born in Ashburton. William Martin (3) is living with his wife Mary J. at Crockaton in the 1901 census. Also in the household are William (4) aged 11, John aged 9, Lily, 5 and James aged 1. 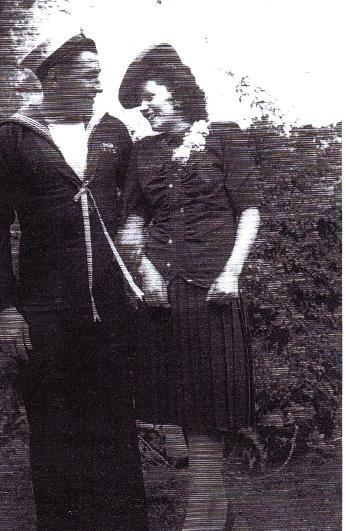 William Martin (4) married Beatrice Dorothy Bray on the 4th October 1913 at Devonport. 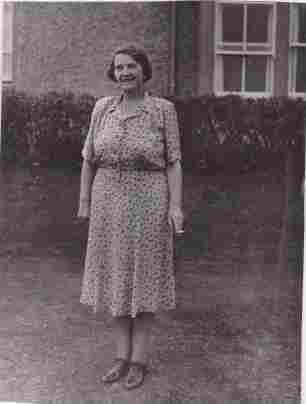 Beatrice Dorothy Bray had been born 25th May 1892 in Buckfast, Devon (source: John Martin). William Martin (4) had a long and eventful life. He joined the army before World War I, and worked his way up the ranks to warrant officer. He was recommended for the Distinguished Conduct Medal 5 times, and served in many of the major battles of the 1914-18 conflict - the Somme, Hill 60 and Ypres. 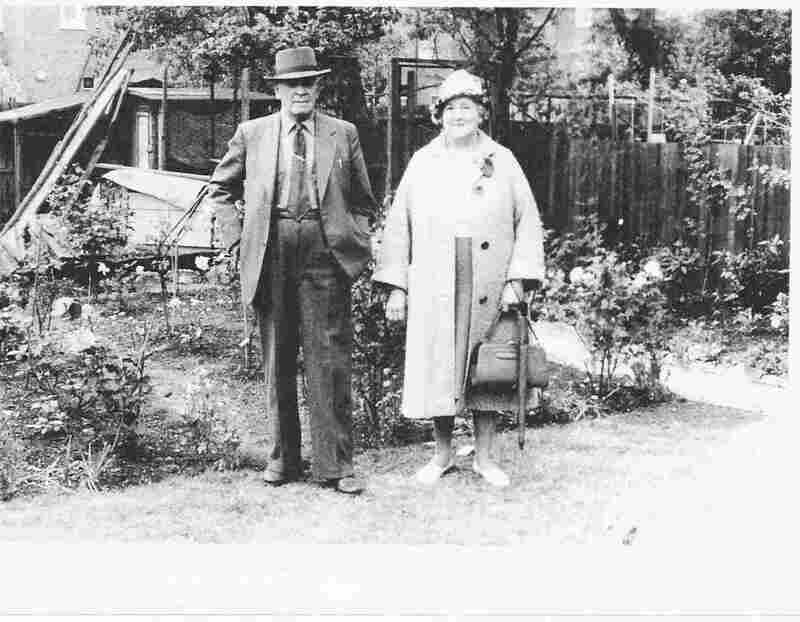 The electoral register of 1930 shows William Martin and Beatrice Dorothy Martin at the Royal Oak Inn. William and Beatrice were married for 68 years and had two children - Eileen, and Russell Herbert. William was 92 when he died. Many thanks to Roy Martin for the above. Above: William and Beatrice Martin, 1960's. As is shown above, in the 1891 census there was a family at Great Bridge headed by a widow named Mary J Pascoe. She is a wool weaver from Cornwall and she has 3 children, two of them born in Yorkshire. The youngest, William, aged 1, was born in Ashburton (http://www.freecen.org.uk/). Mary Elizabeth married a Penwarden (source: Christine Lunt) - probably Herbert J Penwarden, in the Holsworthy district in the September quarter 1911.